So, my journey in Sofia has been something very different so far to say the least. As I reach halfway point it is only now that I am finding the time to update my ‘online sketchbook’ or in other words just ramble about my wonderful time here. It is a very particular city is our Sofia. It is both very beautiful and very peculiar at the same time. The reason I came to Sofia, Bulgaria was to be part of the World of Co Residency for 2 months and as I said, I am only around half way through at the moment but so far it has been a journey in its own. It is my first residency (eek! ), since graduating from Art School only in July I am still new to the whole art world. At first I was perhaps wary to come so far to do an artist residency, especially since the assumed persona of Bulgaria as a country. I did not really know what to expect and with being super awkward and shy and just an all round weird and uncomfortable person, the more I thought about it after I had agreed to go the more I questioned if I was doing the right thing. But I guess in life you never know if you are doing the right thing until you’ve done it, and then if you don’t do it you always wonder what if? So, yes – I guess you could say I was a little apprehensive but for sure, it has been crazy amazing being able to be a part of such a wonderful residency. The hosts are also especially lovely which was something I was concerned about at first. You know how you can get very special characters, shall we say, within the art world but these guys Lidiya, Stela and Daniel are the loveliest and most welcoming and most helpful people I have ever had the chance of meeting. And without them being here to help out with critique, suggestions and workshops etc., I think my time here would have been very different. Not only in terms of the artistic side of things, they were also very helpful in getting around the city and even actually outside of Sofia also. It is nice to learn a little about the city and country as a whole that I will/would be spending two months in. Like I mentioned, they offered a variety of workshops, talks, studio visits and exhibition openings for us to attend which were all super helpful and inviting things to do. Specifically, within this post however, I am going to talk a little bit about two of the traditional workshops that I attended. I’ve learned a lot about Bulgaria and the history about not only the art but also history of politics and how corrupt (in some cases), the country is still now. But I guess that is a story for another time, I shall try not get carried away on irrelevant tangents. So yes, although both workshops were very different – to me they were also similar in a sense. The first one that I attended was the wood carving workshop which was painstakingly hard. Especially for someone like me who doesn’t have a three dimensional brain at all, in the slightest (ha!). Our tutor for the day Steliyan, was an incredible maker. He told us that he had been wood carving since he was a child. I can’t remember exactly how old he said he was when he went off the wood carving school – I think it was perhaps 11 years old. And it sounds insane. At such a young age he moved across the country away from his parents, his family and friends to master the craft of woodcarving. Woodcarving is an ancient art that can be seen in places all throughout Bulgaria, especially in sacred realms of the churches. Before I attended the workshops I had seen some woodcarving structures and works already on my travels throughout the city and I did appreciate them for their beauty but I didn’t fully appreciate the structures until after the workshop. It was the first workshop of the residency and I didn’t really know what to expect. But it was way harder than what I did expect. There are so many different components that one has to think about when creating a work – and even though we were creating something that was obviously very simple and (apparently) very easy, I still struggled. It was obvious to me now, why it was considered such a masterful skill. Here is the little sample that I created within 5-6 hours. It of course isn’t a great and wonderful thing. 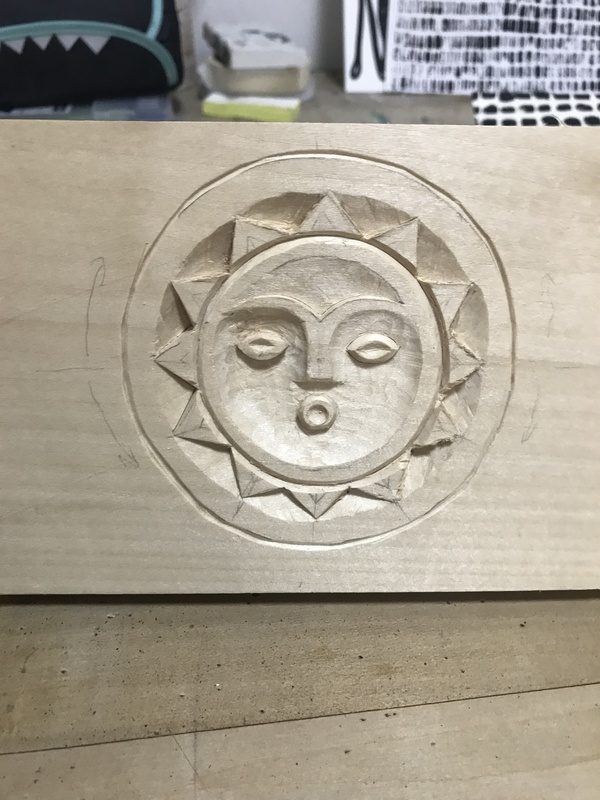 We were taught how to use the tools and the chisels but my head just could not wrap around the 3D aspect. Nevertheless, it was definitely a worthwhile exercise – for me anyway. Although I struggled with it a lot it made me appreciate the real beauty of traditional Bulgarian arts. And, in a way it also reminded me a little of my work or the concept behind my work, more specifically. There was a lot to the process of making the works. Something that isn’t seen, and something that is sometimes disregarded. It is a skill that takes a lot of patience and months or even years of hard work to create just one piece. It is a combination of patience and determination as well as willingness to keep going – and this is what inspired me whilst simultaneously reminding me of my own practice. As well as having a little taster of wood carving, we also had a workshop learning and experiencing carpet weaving. It is both very different and very similar to woodcarving. It is a different way of working and a completely different outcome at the end. However, both processes were rather slow and repetitive – something similar to my practice. I have to admit, I was slightly more looking forward to carpet weaving as it reminded me of different activities I would do with my Gran when I was little and for some reason I imagined in my head a group of little old ladies weaving the carpets together and chattering away to their hearts content. And I was for sure not disappointed. Carpet weaving is a traditional Bulgarian craft almost as old as time. There are many stories and tales to all things related to carpet weaving. Traditionally in Bulgaria, girls would learn how to weave from a very little age – our teacher for the day Velika told us that she started learning when she was only 4 years old! This was in preparation for when the girl became engaged to be married. During this time, the engaged woman would lock herself away for some time before the wedding with some of her closest friends and she would begin weaving a carpet for her husband-to-be. She would create the carpet which told stories. You see, the carpets were made up from designs and motifs specially from Bulgaria called Shevitza. This is the code of Bulgarians and is over 3500 years’ old which is still seen a lot today all over Bulgaria. There are many symbols that have various meanings as well as the colours having meanings also. The Shevitza however is different depending on the individual’s perception. So when the bride to be would be making the carpet she would weave ideas for her future. There would be symbols symbolising different things such as wishing them luck for the future. Symbols of fertility and wealth. The greatest wealth, however wasn’t money – it was family. If at the end of ones live, you had a spouse and children everyone was concerned that you had the best live possible which I really enjoyed as it seems different from todays world and concepts. The whole process was so relaxing and calming for me, it was something that I would definitely like to do again. Perhaps its repetitiveness is what I enjoyed about the workshop because it reminded me of my own practice and also worked as a sort of therapy –or could do for some people. Not only this, but it also reminded me of my Gran. Both my Gran and my Gramps were/are very creative. My Gramps was a painter and I guess this is partly where I received my artistic abilities from. But my Gran is also very creative in a different way. Ever since I was little she was always sewing, doing cross-stich or making tapestries. She was very into her crafts and working with her hand and I vaguely as child remember her saying idle hands create and idle mind and I think subconsciously this always stuck with me. Which only now when I am writing about it I am actually truly understanding it to be true. I often find myself just doing stuff whether that be making or whatever because I don’t like sitting doing nothing all the time. I mean I like to watch a movie as much as the next person but I feel like I have this need to be making – keeping my hands occupied. By doing so, this makes me feel less bored – even though I’m not bored? Perhaps this makes no sense to someone else who is reading this but finally I actually feel something else – may it be a minor thing- has clicked.